My seatbelt has become twisted in such a way that I cannot work out how to untwist it. Given that both ends of the belt are fixed, how is that I cannot untwist it? No matter what I do I end with up either it twisted across my lap, or against my chest. Looks like I will have to detach it from next to the seat (presuming I have the tools to do so) or just live with it? But how can this have happened?! Author adminPosted on July 16, 2009 Categories My MINI1 Comment on Let’s Twist Again! 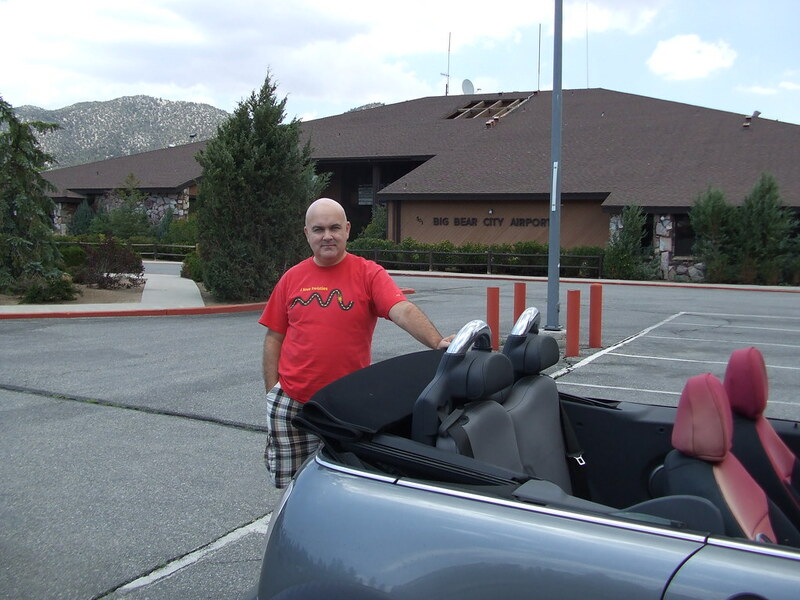 Nothing much to say so thought I’d post this picture of me and my MINI at Big Bear Airport. So far the only way I have found to combine flying and motoring is to drive to the airport, too bad I can’t do it the other way around. Teri and I took a day trip to Big Bear, about 3 hrs each way but the air was cool and crisp on the mountain and we were able to put the top down. On the way back we had the twisty road mostly to ourselves, had a blast shooting around the corners.